We offer customizable residential steel roofing in Ontario perfect for a home, cottage, garage, garden shed, and other uses. With an array of colors to choose from and diverse applicability, the steel roof panels will be adjusted in style to match the exterior of your residential home. 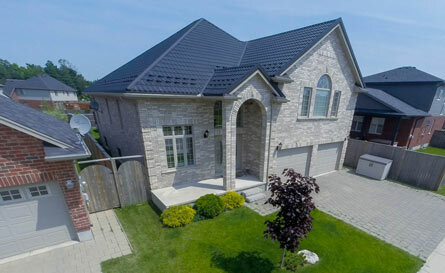 Cut to size, affordable, and long lasting, if you're looking for a steel roof Toronto for your home, Ottawa, or elsewhere in the province, choosing the right steel roofing contractor makes all the difference in the world. If you're looking to upgrade your current residential roof, we will provide you a high quality product that will endure the elements, compliment your home, and not break the bank. Contact us or use "LOCATIONS" tab from the menu to find the showroom closest to your home location and talk to a member of our staff who would be happy to help you with any questions you may have.